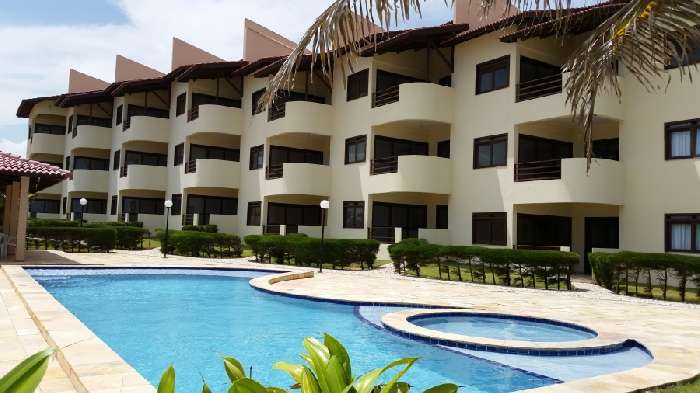 Taiba Beach Gardens is a fabulous complex located on Taiba beach close to the town of Sao Goncalo do Amarante in the Rio Grande do Norte region of Brazil. Taiba is a beautiful fishing village with a slow pace of life and world class unspoilt beaches just 65 kms from Fortaleza. The complex has great facilities and is in a great location, close to all amenities. This is a ground floor, beachfront apartment for sale in Brazil with 55 sq m of living space. It comprises a spacious living with dining area and kitchen with American style breakfast bar. There is a family bathroom, a double bedroom and a private garden overlooking the pool and the sea, perfect for relaxing and enjoying the view. Taiba is in the northeast of Brazil and the beach is well known as one of the best kitesurfing, windsurfing and surfing spots in the world, attracting many tourists every year. Other activities in the area include jet skiing, water skiing, scuba diving, driving beach buggies in the dunes, horse riding on the beach and fishing with the locals. The apartment is close to great shops, bars, restaurants and excellent nightlife. The roads are in great condition with connections to the neighbouring towns and cities further afield. A fabulous apartment to buy in Brazil with excellent rental potential! !